The trick to squeezing every last penny and mile out of a beater bike – that jalopy you ride every day and leave out in the rain – is to put in only the minimum time and effort required to keep it running adequately. In that spirit, here is a quick and dirty guide to greasing up and aligning your bike's wheel hubs. 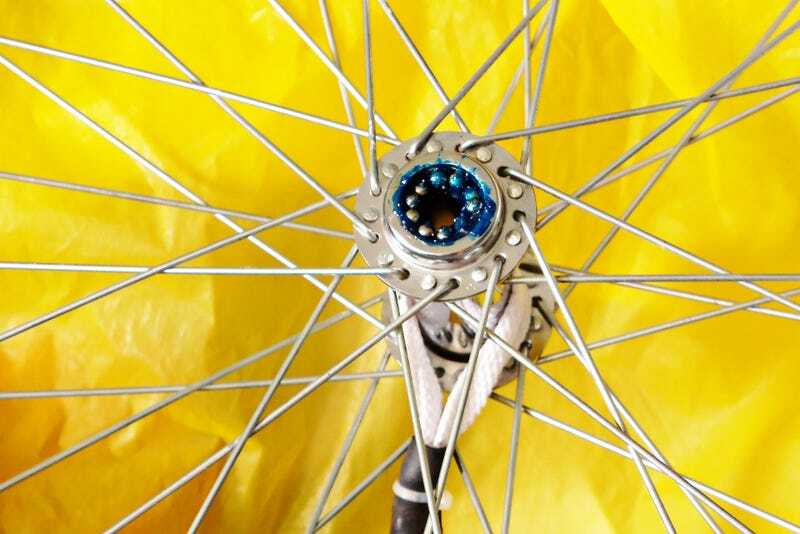 Unlike converting a bike's bottom bracket, which is something you might have to do to turn your road bike into a single-speed, adjusting the hub on a run-of-the-mill bike wheel only requires special skinny (cone) wrenches, a vise, and grease. Let's dive in! And here is a closer look. A hub's adjustment is locked in place by tightening the locknut (top wrench) against the cone (bottom "skinny" wrench), both of which are threaded onto the wheel's axle. Turning the locknut and cone in opposite directions drives them apart, allowing them to be removed from the axle. The cone (left) and locknut (right) have now been removed. You can see some ball bearings inside the hub. If the inside of the hub is relatively clean and the existing grease still glistens, I don't bother taking out the ball bearings and cleaning everything out; I simply wipe the cone clean and add fresh grease on top of everything. When the hub is fully greased, we get to the final and most important step. Every hub has a Goldilocks adjustment: that sweet spot point between being "too tight," which means the wheel quickly grinds to a halt, and "too loose," wherein the rest of the wheel wobbles around the axle in an unsettling (and potentially unsafe) manner. You start by threading the cone on the axle until it will go no further. Then, thread on the locknut by hand, until it is snug against the cone. Now, using the appropriate wrenches, tighten the cone against the locknut by turning it counter-clockwise against it. Unvise the wheel and check for play. SUCCESS—a vise, a bit of wrenching, and a little grease will now allow you to keep squeezing every last bit of value out of your beater bike.